This is the shot I dreamed about all night. 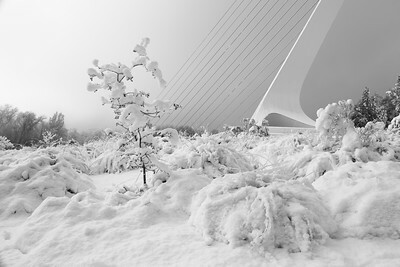 After several hours of snow, and one cold evening, Saturday morning greeted me with an adventure which included a trip to the Sundial Bridge. I tried to make it to the bridge Friday night, but avoiding 15 wrecks in about 2 miles became my priority and I decided to wait until the morning. By lunch time the snow had gone, so I quickly turned the AM hours into an adventure. With my wife by my side, we capture this rare snow scene. 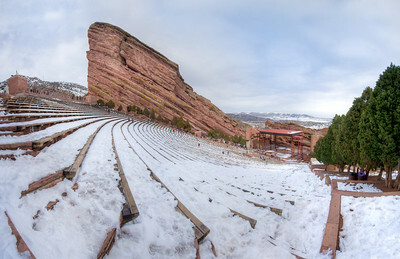 This is a stitched panorama of the outdoor venue Red Rocks in Colorado! Every year there are a few hundred crazy people in far northern California that adventure into the backcountry to seek soft white snow and solitude. This photo was captured after an epic ski-down from the peak in the upper left of the photograph. Chris (me) and Mike (dad) were winded, excited, and totally thrilled to be outside and alone in such a beautifully epic outdoor environment. Technically, this photo is not perfect, but in my heart, this is perhaps as close to perfect of a moment I will ever experience; for me, this is winter. 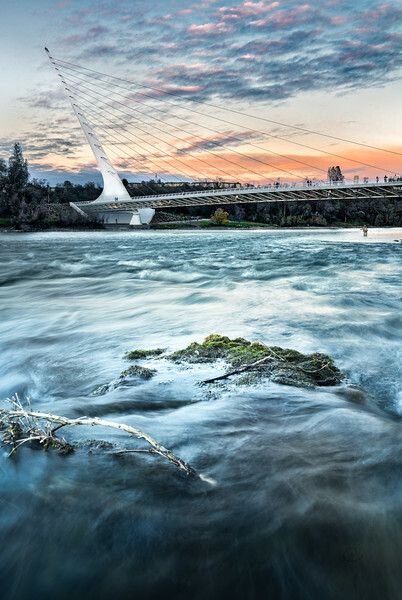 To my knowledge, this is the highest water level the Sacramento River has reached since the construction of the Sundial Bridge. 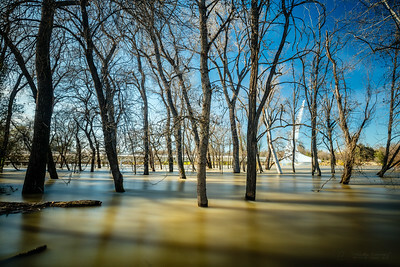 Captured here with a LEE Big Stopper, Landscape Polarizer, and ND Soft Grad filter, this photograph emphasizes the brown water in the foreground, and many trees which are typically well above the high-water line. 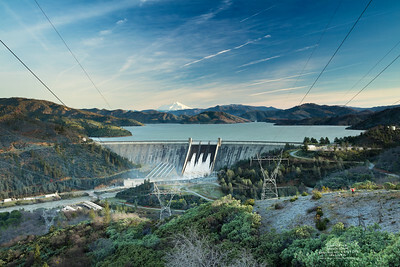 The majestic "Three Shasta's" including a very full Mount Shasta, Shasta Lake, and Shasta Dam. I've been wanting to take a portfolio image from up here for quite some time, and after two very very early trips with two great friends (one being my Grandpa Leon - pictured here in the red jacket - lower right), I finally discovered this perspective. 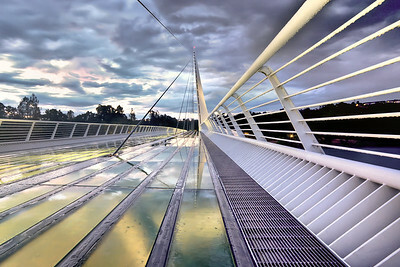 I am in love with this photo, featuring a time-blending technique and capturing from 7:25-8:26am. At this time the flow rate for the dam was exactly 64,769CFS and the dam was at 1061.27ft. 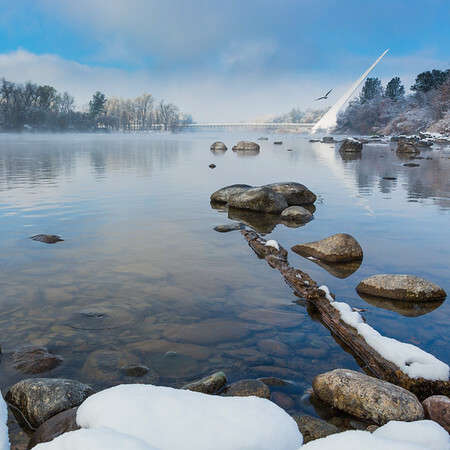 The greater Redding area is fantastically beautiful! Patrick's Point State Park has some of the most beautiful trails and just before the sun sets over the ocean there is almost always a beautiful light show, too. This view is just before you get to the ampatheater where evening programs are presented a few times a week during the summer. 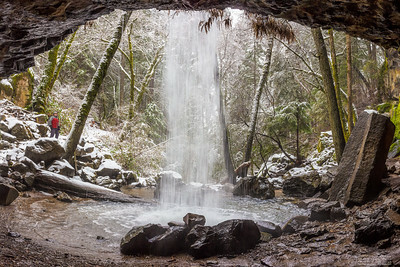 After the first storm of the season, and some dramatically cold days, Faery Falls (also known as Ferry Falls) is frozen. 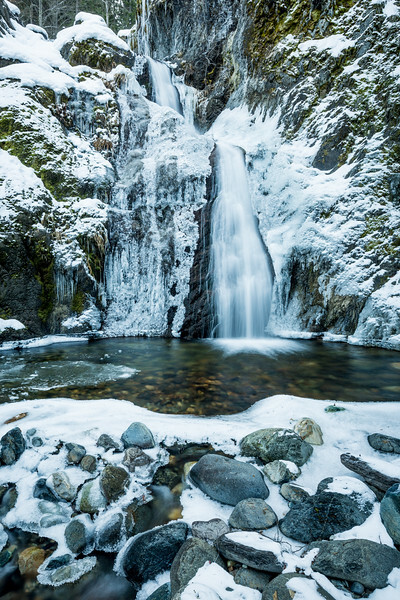 The ice to the left and right of the frozen falls had water moving slowly behind, creating a stunning scene that simply can not be described. The falls is located on Ney Springs Creek and feeds into Lake Siskiyou. 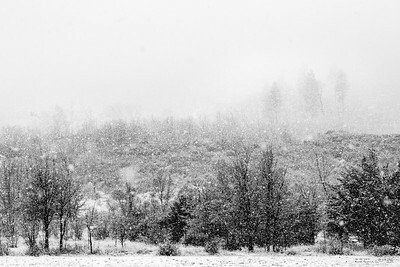 Back in 2014 I captured this photograph on a snowy snow-day, probably before leaving for Redding to get home. I've never shared this photo, but I've always enjoyed it because of the layering created by the hills on Round Mountain - and the tons of snow in the sky. This is a repeat-visit and repeat-composition from a previous visit... check out the other photo, too, which features an incredible amount of ice. I was certain there would be tons of ice again like last time, but the temps were too warm... and it was snowing. So a different take on the same spot, and same composition. Dad is in this picture, too, for scale. I'm going to be back here for another shot, on another day. Captured just walking around in Mount Shasta in November 2012. If you look closely, you'll see a little blue bird! Did you find the bird? There are places I have conceptualized as a photograph for many years. This is one of them, and I frequent these Mountains Near Maxwell all the time, just off I-5 but most of these times I am busy and on a schedule. This time I was on a solo trip and I was able to stop and take a series of photos from 5:36 PM to just after 6 PM. In front of our baby lemon tree a sunflower decided to grow to about two feet tall. 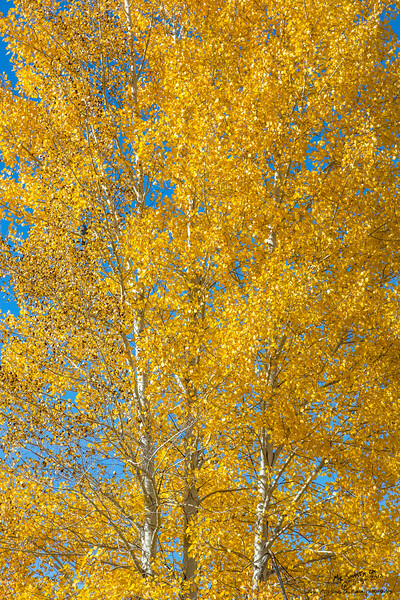 The mixtures of background colors are a combination of a hardwood fence, bark, and the lemon tree. And of course, if you look a bit longer you might find what we're calling an albino special spider! 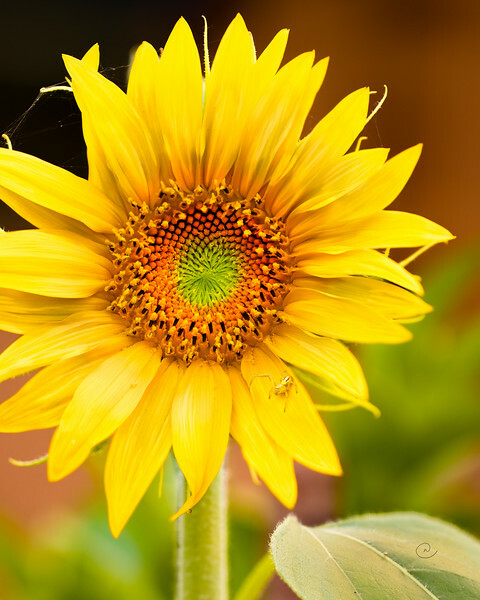 This is a high-resolution photo, so if you decide to order a print, get it BIG and the flower and spider details will really stand out! 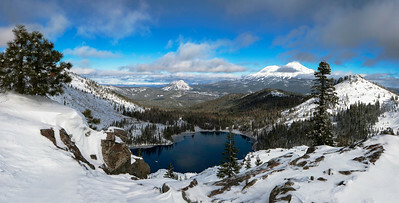 A Panoramic view from near Heart Lake, above Castle Lake. After a snowstorm covered the valley with snow. 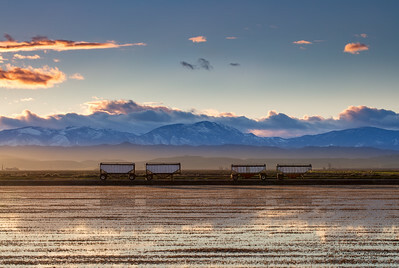 This photo is featured in the December 2015 Enjoy Magazine. On a photo adventure with dad we came across a new-to-us viewspot in Mt. 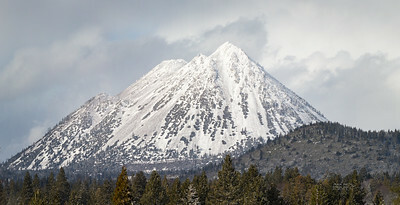 Shasta of Black Butte and Spring Mountain. We will return here to repeat this view sometime soon, that's for sure! This is a multi-image high resolution composite, cropped to 4x5 and still doesn't quite capture the feeling of being there in person. 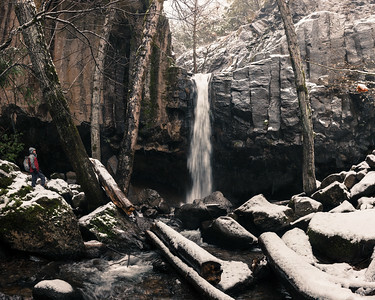 If you haven't been to Hedge Creek Falls, you should go! If you can't go, buy this print, and hang it on the wall to imagine how you'd feel if you were there in person! 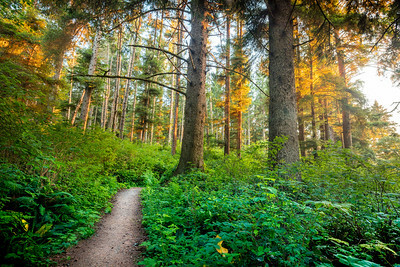 The trail to Sapphire Lake was a wish and somewhat a dream for some time. 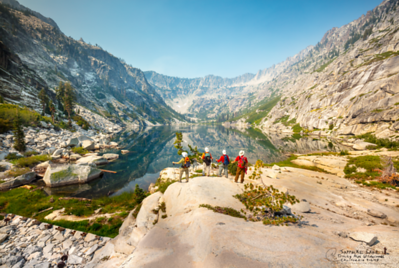 Grandpa Leon (82), dad and I were eager to return to the Trinity Alps wilderness area after a successful group trip several years earlier to the Caribou Lakes. During that trip we hiked up Sawtooth Ridge and viewed our objective for some future date. For the next several years I regularly would stare at a canvas print on my wall of the lakes far in the distance. The "someday" became "today" on September 2nd 2017, when our foursome crested the ridge and viewed the absolutely stunning Sapphire Lake, pictured here. We stayed for a few hours, swimming and enjoying lunch in this sacred place. That memory, and this place, will hopefully remain unchanged for many, many years. Someday in the future I will likely return, hopefully with my children, and I will quietly remember this very special trip, and the very special day when we visited Sapphire Lake together. Pictured left to right: Chris (32), Mike (59), Leon (82), K (54). Rocks frame the dynamic ocean, similar to the edges of a boiling cauldron. ...well, at least, maybe. 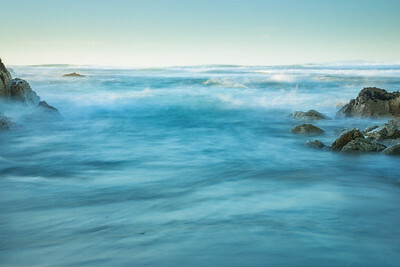 The completely dynamic scene was captured on the Monterey, Ca coast in the afternoon, on a warm February day. The rain was falling as this photo was captured. Dynamic sky and spire reflection. Frank Kratofil is a fantastic photographer, and this image was captured on our second meeting, and first time out as fellow photo nerds! I like this composition because the twig in the foreground somewhat resembles the bridge, and the green covered rock also in the foreground has a similar tone to the trees behind the bridge. There is a lot of detail in this image, including the guy fly fishing and also the people on the bridge and under the bridge. Frank was just off camera right composing his equally interesting image.